I then compiled data from the logger, which was tedious because I was sampling at 25Hz with a max file size of 90,000 samples. So, I had to combine many files in excel to produce a single data set for the accelerometer output which had 885,265 data points (Raw Data)… In retrospect, this was a little overkill, as there is nothing in the body that is happening so fast that you need to sample 25 times a second! 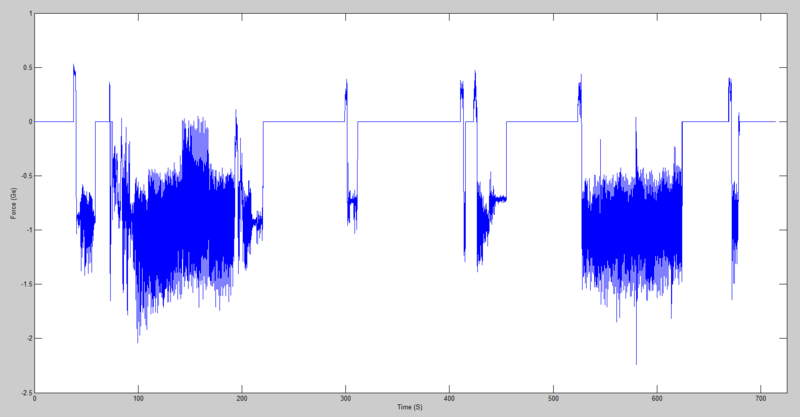 Once this data was imported into Matlab, I was able to plot it versus time, where time was given in seconds since the beginning of the recording period. I wanted to plot the data versus the hour of the day however, and it took me a while to figure out the ultimately trivial commands. I first used the command ttime= datestr(t/86400+datenum(2013,10,14,22,54,14)) to create a date string which would combine the seconds elapsed with the start time to produce absolute rather than relative time measurements. I then converted that string back into numbers using the command tdate = datenum(ttime), and plotted all the data versus this new time variable. Finally, I changed the formatting of time ticks to just show the hour of the day using the datetick(‘x’,’HH PM’) command. I also created a vector based on the FitBit sleep data, which I had to manually grab from the app by sliding my finger around the plot and noting the start and stop times of “restlessness”. 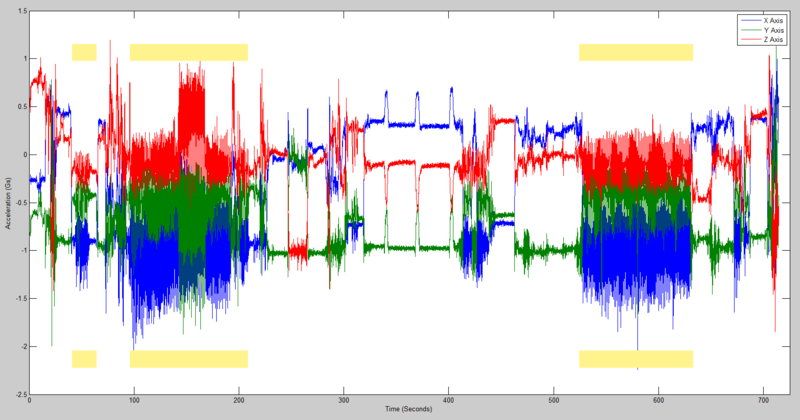 This was then overlaid ontop of the accelerometer data (as shown below), with an arbitrary magnitude. Needless to say, I was very surprised by this data. 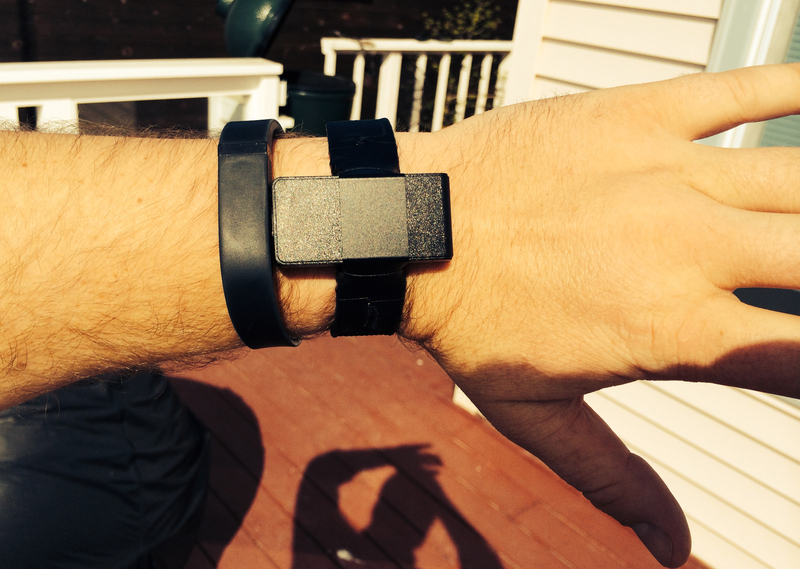 First, there was much more movement than I had anticipated given the relatively stable reading from the Fitbit. 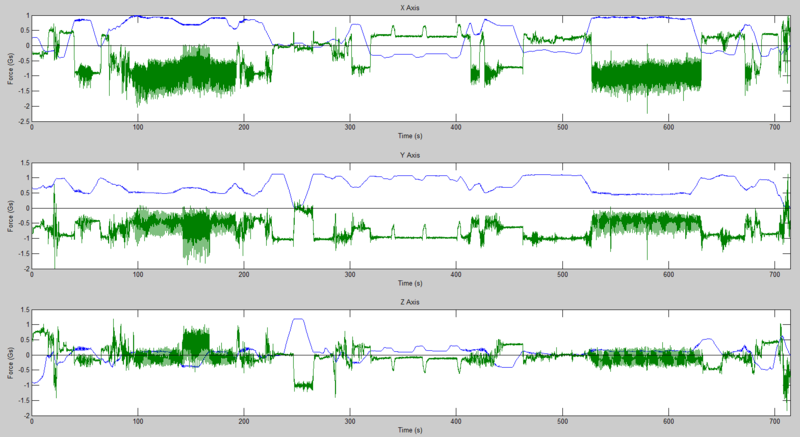 Second, I was surprised at the low correlation between the data from the Fitbit and the logger. Without doing any quantitative analysis, it is easy to see that Restless Period (RP) 1 is due to a flurry of motion, which most likely represents me trying to fall asleep. 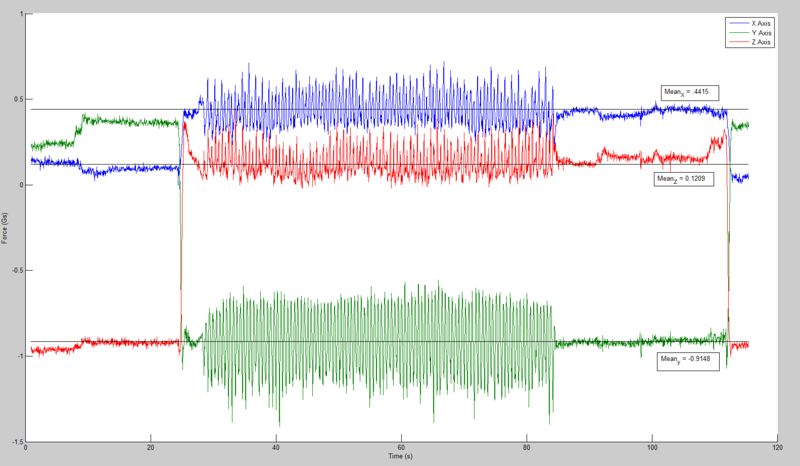 RP2 seems to correlate with the spike in logger data which occurs just after it, and the discrepancy in timing could be due to the fact that FitBit quantizes data into 1 minute intervals, as well as differences in timing between the two devices. RP3 corresponds nicely with a large spike in the Y Axis, however the subsequent movements between 3am and 7am do not trigger any “restlessness” events, and there does not appear to be a clear trigger for restlessness based on either magnitude or duration of movement, which is somewhat perplexing. 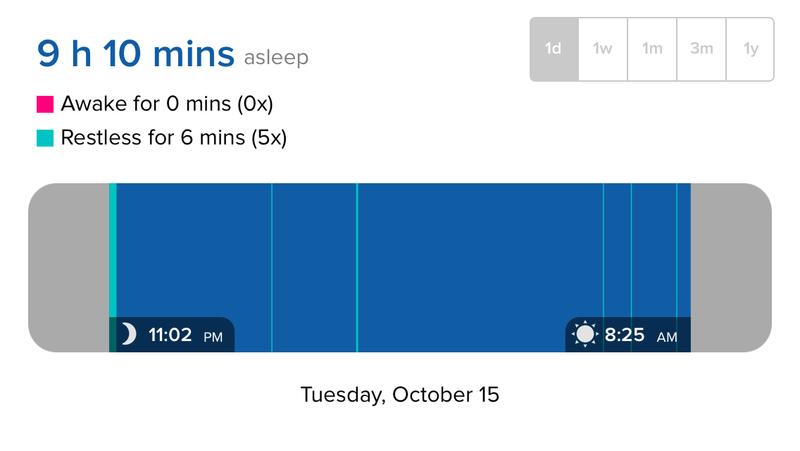 Perhaps FitBit’s algorithm is more nuanced, and takes into account the predicted sleep cycle. For example, the extended period of stillness from about 1230am to 130am might have registered as the first REM cycle, such that motion which occurred 4 hours latter in the next cycle was ignored because the algorithm predicted that I would be in REM sleep once again. 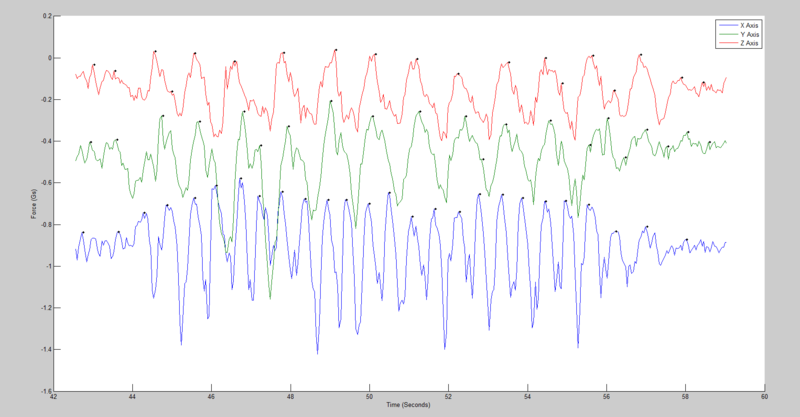 It should also be noted that I was not sleeping alone during this data collection cycle, but as the data shows, there was nothing going on but sleeping because there are no high frequency, sinusoidal movements…. Giggity. In order to test the logger in a real world situation I needed to mount it. I chose the wrist as the test location, so that its data could be easily compared to that from a FitBit or other activity tacker. I bought several wrist bands from Amazon, and used electrical tape to secure it to $5 nylon band. I thought this would only be a trial solution, but despite the clunkyness of the mounted logger, it actually turned out really well and there was no need to improve upon the mount. 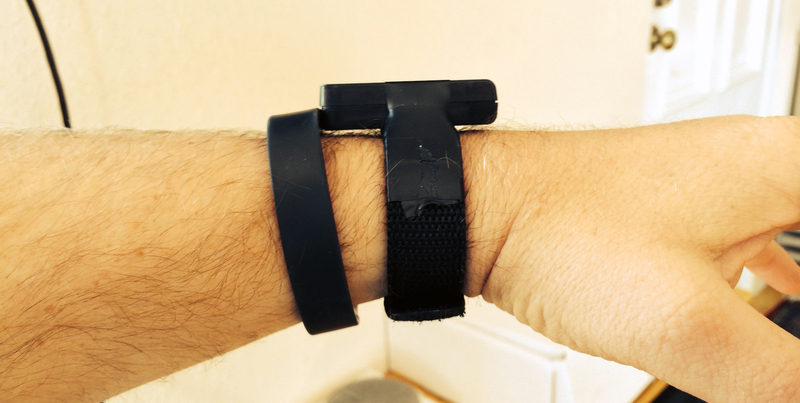 Once mounted on my left wrist, I had to decide what to do with my arm while walking. 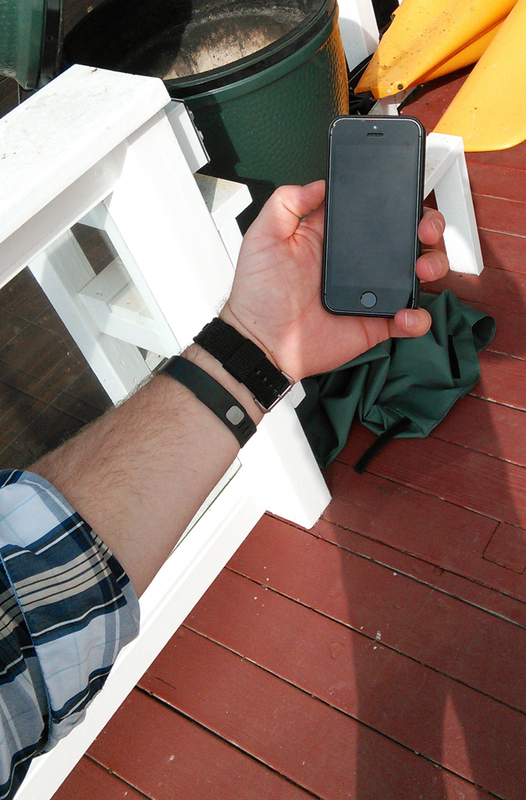 I chose to hold my phone in the monitored hand and walk with my arm stretched out in front of me as shown below. I wanted to keep the step signal as simple as possible and avoid the introduction of any swaying arm motion back and forth at this point. Figured holding my phone would give it additional inertia and help damp out any swaying back and forth (in addition to allowing me to see my fitbit step count). With my arm held steady as shown above, I recorded a brief sample of data at 25Hz while standing still in order to see what the baseline measurements for the logger mounted in this location were. I produced the plot below, which includes the average values for the X, Y and Z axes from time t = 5 to t = 17. The change in the forces at the beginning and end of the plot makes sense, as I had to activate the logger with a magnet while looking at it as you would a watch, and then roll my wrist over to hold the phone as shown in the previous photo. 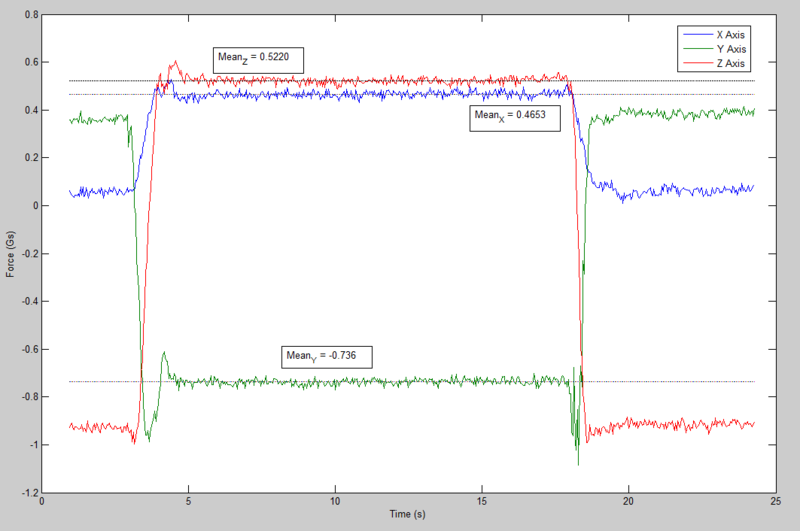 I then had to roll it back to turn the logger off with the magnet at the end of the plot, which took a bit longer. I was initially concerned that the sum of the three highlighted forces did not equal 1, because in a previous post , where the device was sitting at rest on a table, the sum of the all three forces was always approximately equal to 1. I then realized, of course, that is the vector sum of the forces which should be equal to 1, i.e. sqrt(X^2+Y^2+Z^2) == 1. This calculation was not necessary in the first post because the static force of gravity was always parallel to an axis. With fractional components of the gravitational force in each axis as in the above, however, it is extremely important, and the vector sum of 1.0152 for the three values above gave me sufficient confidence in the device to proceed. The first thing that jumps out in the plot above is that the X and Z axes have flipped position. I think this must be due to a slightly different hand position while walking, which is supported by the very different mean values that the axes are experiencing. Although there was also motion introduced into the data here, this is probably not the primary cause because even during the period of non-motion which occurs after the steps from about t = 85 to t = 110 seconds, the X and Z axis are still flipped. 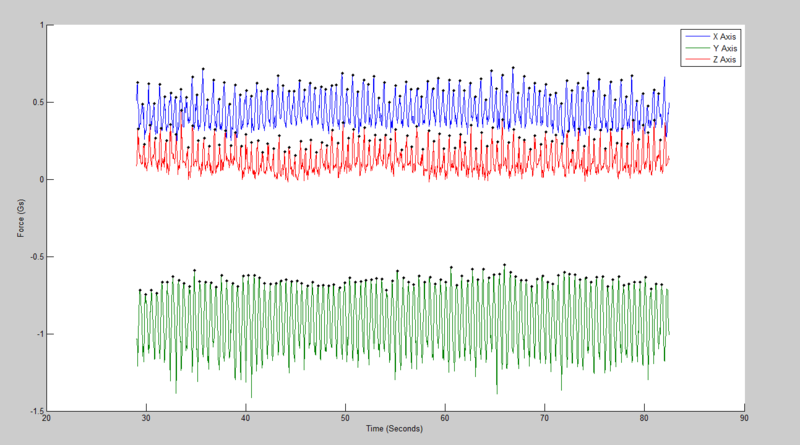 Regardless, trying to compare the two plots in this post based on something as vague as my general arm position is not a good use of time – I will just assume the data logger is correct. Run the script, which will prompt the user for the start and stop time of the period they would like to analyze in the data, as well as for the accelerometer sampling frequency. The script then uses the findpeaks function built into matlab, and passes it inputs around the minimum peak height and the minimum distance between peaks (‘MINPEAKHEIGHT’ and ‘MINPEAKDISTANCE’). 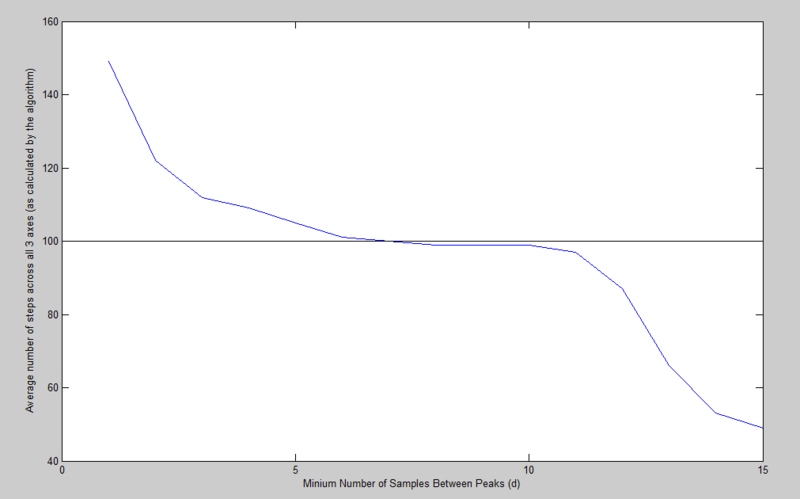 I used the mean value of the data for a given axes in the given time frame as the minimum height (so as not to double count cycles), and set the minimum peak distance to 10 samples. In the future, it would be interesting to run a FFT on the data, figure out what the average frequency of my walk is, and then have that data inform the minimum distance between steps. But let’s just keep it simple for now…. 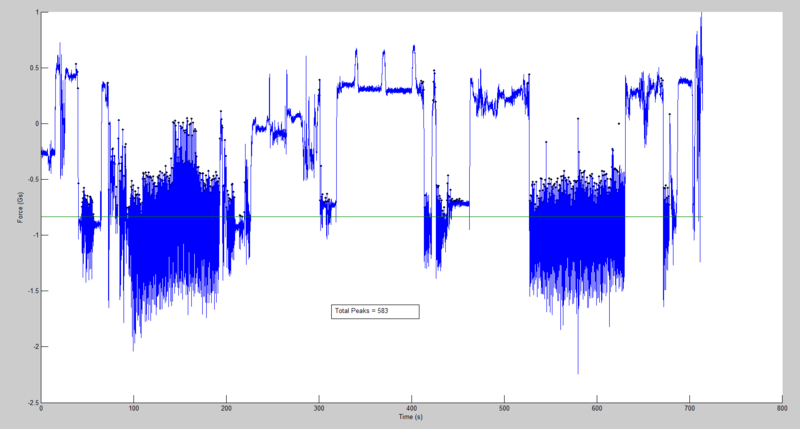 The peak data are then plotted back onto the original input data, which have been cropped by the start and stop times. The number of Peaks, aka “Steps”, are then displayed for the data from each axis, along with an average of all the axes. 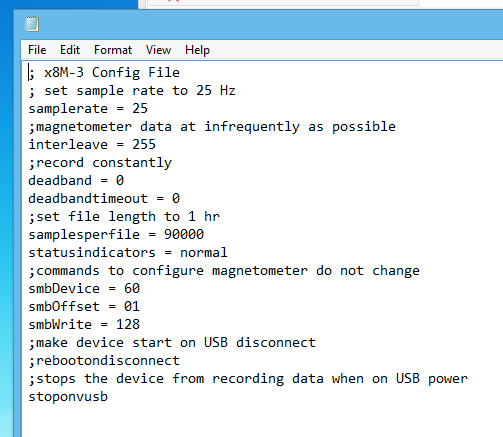 I purchased a pair of self contained data loggers, which have a 3 axis accelerometer, 3 axis magnetometer, 2GB of internal storage, and a 250 mAh 3.7v Li-po battery. They measure about 50mm X 26mm X 12mm, and are surprisingly light at just around 10g (not including the housing). The data was generally as expected. In each position, one axis should have experienced 1g while the other two axes experienced no force. 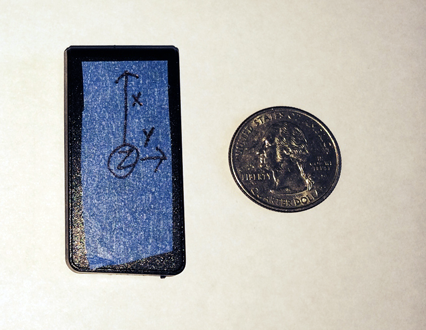 Minor variations can be explained by the surface the device was sitting on during the test not being completely level, which is compounded by the fact that faces of the case with seams bulge out in the middle. This might have impacted the readings in which the X and Y axes were parallel to gravity. 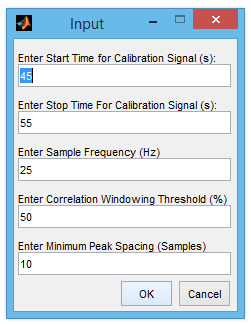 In any case, the stated zero-g offset accuracy for the device was +/- .15g for the X and Y axes and +/- .25g for the Z axis, and the data are roughly within those bounds. More important than device accuracy, however, is its precision, since we will be most interested in relative motion in future experiments. Form time t = 2 seconds to t = 12, the standard deviation of the measurements in each axes was calculated: X = 0.012g Y = 0.011g Z = 0.012g. This tight clustering shows high precision in the device.